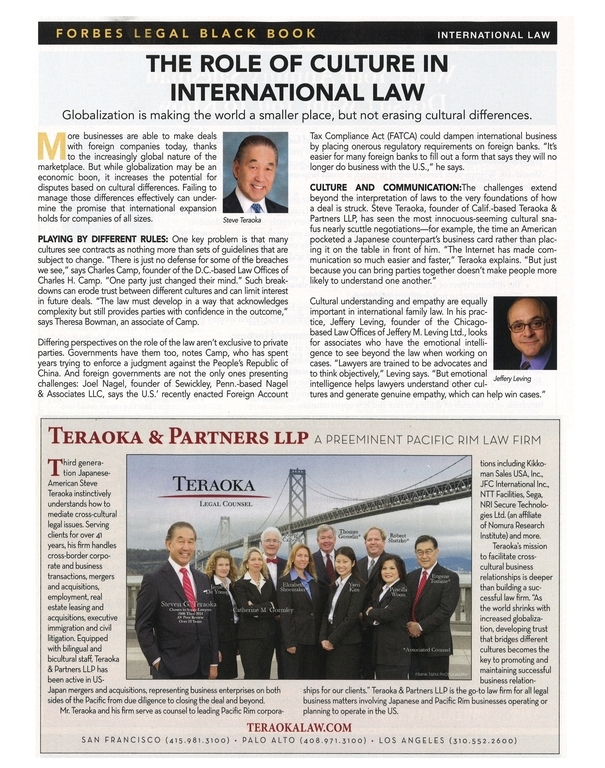 Teraoka & Partners LLP has been recognized in the Forbes Legal Black Book as an elite U.S. international law firm. An article appearing in the 2015 Billionaire Issue of Forbes Magazine, “The Role of Culture in International Law,” recognizes Steve Teraoka’s experience and cultural savvy when it comes to helping major global companies achieve their business goals in the United States. Teraoka & Partners LLP, a pre-eminent Pacific Rim law firm, will celebrate its 40th anniversary in 2016. The firm advises a blue chip list of global businesses on international corporate and business transactions, mergers and acquisitions, employment, real estate leasing and acquisitions, executive immigration and civil litigation.